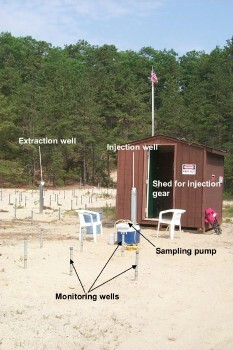 The site on Cape Cod, Massachusetts, where USGS scientists conducted experiments on the transport of arsenic in ground water. The experiment consisted of injecting a solution of ground water (from the extraction well) with dissolved arsenic added into the subsurface through an injection well. Monitoring wells where then used to sample the arsenic plume for study and analysis. The most common source of arsenic contamination in ground water is the mobilization of naturally occurring arsenic on sediments. Given the right chemical conditions in the subsurface arsenic can dissolve into ground water used for drinking water. Arsenic can have adverse health effects in people who drink water high in arsenic. 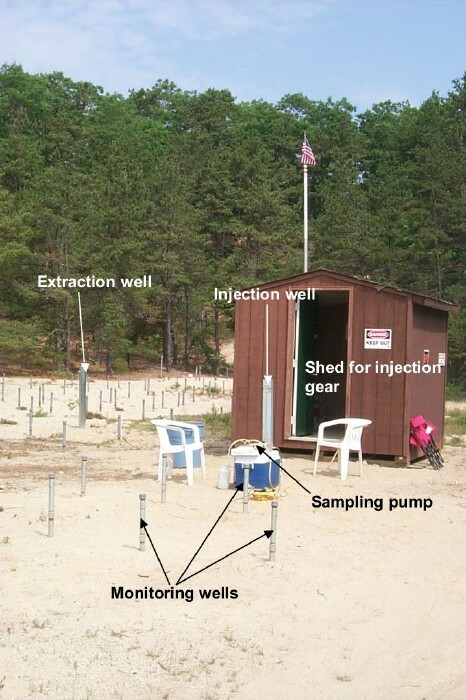 U.S. Geological Survey (USGS) scientists and their colleagues are conducting field experiments on Cape Cod, Massachusetts, to understand the biogeochemical processes that control arsenic mobility in ground water. The results of one experiment, recently reported in the Journal of Contaminant Hydrology, demonstrate that chemical reactions between nitrate, iron, and oxygen can affect the mobility of trace amounts of arsenic. Their experiments consisted of injecting a solution of ground water with dissolved arsenic added into the subsurface through an injection well. Monitoring wells in the resulting arsenic plume were then sampled and analyzed to study the chemical processes controlling arsenic mobility. The resulting information will help water-resource managers understand what conditions would favor the mobility of arsenic in ground-water supplies. Höhn, R., Isenbeck-Schröter, M., Kent, D.B., Davis, J.A., Jakobsen, R., Jann, S., Niedan, V., Scholz, C., Stadler, S., and Tretner, A., 2006, Tracer test with As(V) under variable redox conditions controlling arsenic transport in the presence of elevated ferrous concentrations: Journal of Contaminant Hydrology, v.88, p. 36-54.